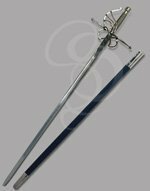 This rapier is very similar to our Royal Rapier, with a few important differences--the Highborn Rapier has a longer blade and minor variations in the guard. 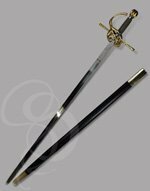 This longer blade helps balance out the weight of the beautiful swept-hilt basket-guard and provides a more historically accurate length. The guard is a gorgeous tumult of steel that provides ample protection for the hand and plenty of space for finger-work. 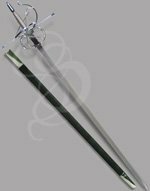 The polished hardwood grip features a spiral of braided-steel wire that says "I am both highborn and lethal" (or says, I trained hard enough to kill a highborn swordsman and take his/her sword. We won't judge). For the price, the craftsmanship is quite good. Real wood handle with recessed wire. Etching came out good. The sword is much bigger than expected. 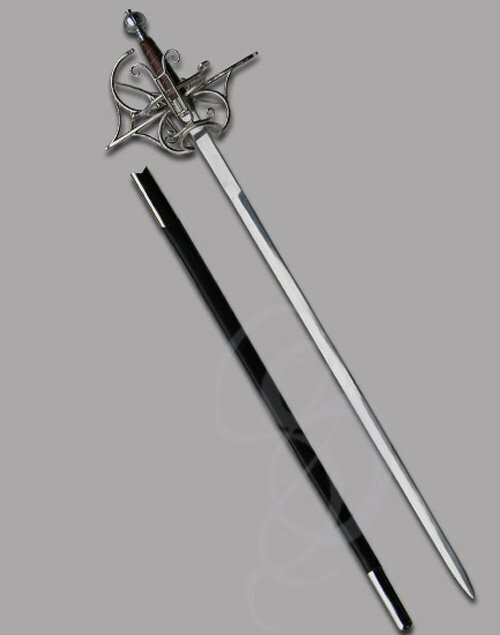 The whole swept hilt and everything is generally about the size of my head. It's heavy, and the blade is fairly stiff. The pommel, handle, and blade are all well fixed together, so no wobble there. As for the "battle readiness" factor...well I won't say anything about that since I haven't put it to the test. They say it's full tang and high-carbon steel...so if that's true, it should be pretty good function wise.